Our school year is 7 6 5 days away from coming to a close. There are many to-do lists to complete, shelves to clean, supplies to pack, and (large) stacks of paperwork to file. I am sure that all my fellow teachers, DREs, and catechists are in a a similar state of busyness. But a more prominent item on our minds is saying good-bye to our students. For some it is just a formality, because we will see them around in the parish or school or community. But for a few kiddos in our classrooms, it might be more serious good-bye due to moves or transfers. Regardless, the end of a school year signifies an end of a chapter and a change in the relationship you have with these kids that you have spent so much time with over the past year. At the end of the school year, I like to give my students a unique book. I pick out a story book that can be used to carry a special message to the whole class. On the inside cover, I write each student a letter that talks about the special meaning of the book, as well as specific encouragement just for them. It takes a long time to write the letters, but makes the simple story book so much more meaningful, and something that I hope the students treasure. A couple of years ago, I used the book You are Special by Max Lucado. In the letter for this book, I included all of the things that I thought were special about each student, but reminded them that they are unique and wonderful because of who God says they are. It was a perfect book for a tight-knit class that both loved...and challenged...each other just like a set of 29 siblings :). Last year I used the book The Boy and the Ocean, also by Max Lucado. The main message of the book (which has lovely illustrations) is that God's love is big, and wide, and never ends. I thought it was a great reminder for a class that went through a lot of changes and challenges in our year together. This year's book is not specifically a Christian book, but it has always reminded me of the story of the Prodigal Son. (I actually have an activity about it here!) In the letter in this book, I am going to remind the kids of the power of generosity, and that just like the giving tree, our God loves us so much that He gives and gives and gives, even to the point of completely giving us Himself. Our response should be like the boy's at the end of the book- to want to be with Him always. So, that's what I do at the end of the year. However, story books and letters might not be the right thing for you. You might be looking for a birthday gift, or graduation gift, or a thank you, or a First Communion or Confirmation gift. You might be able to spend $0.99 per kid, or $30 per kid. I thought I round up a few of my other favorite ideas that can be used for varying ages, budgets, and purposes. books on the Saints (this series is one of my favorites for 3rd-6th graders) ***make sure you keep an eye out for the books you can buy at bulk prices ($2-3 a copy) from Totus Tuus Press and Dynamic Catholic- they have great stuff for both teens and adults. Those are my favorite gifts to give students- what are yours? I'd love to hear more about the gifts you give your students that are affordable, memorable, and meaningful. 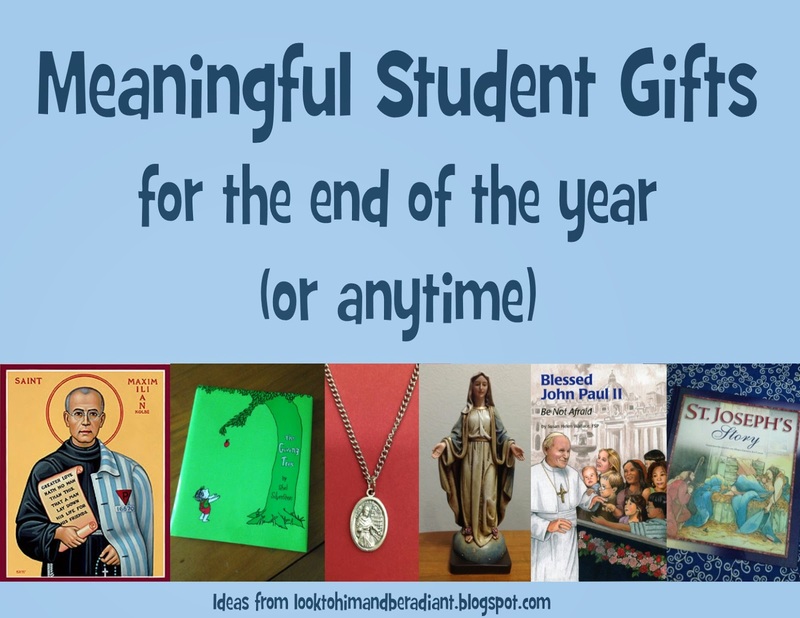 Blessings on the end of your school year! I've just been tapped on the shoulder to run catechism class at my parish as a fill-in for a few weeks. The children are in the 6-9 years age group, and there are about 10-12 of them. Classes run for about 45 minutes. I'm an instrumental music teacher, so I'm used to one-on-one classes with kids who are at least nine years old, and I have no experience teaching catechism. Could you suggest any good resources? The first class I have to teach will be about the Blessed Sacrament. Wow, Julia- congrats on the new responsibility! I am sure that your students (and you) will be learning lots! You are facing a fun challenge both by filling in for someone and by having the mixed ages. There are so many resources out there! You will find lots of great things. Don't be afraid to over plan- once you see what a group of kids responds to, you can always cut as necessary. Feel free to email me at katherine (dot) bogner (at) gmail (dot) com if you have any questions!